2011 Designer Show House … Now Open! I’m thrilled to tell you about our magnificent 2011 Designer Show House. Anna Marie and I went to see this year’s show house for the first time and we were VERY impressed. We weren’t quite sure what to expect, as this house is very different from past show houses. We need not have worried. This year’s show house, a brand new $2.2 Million 4-story townhouse, really is a departure from the renovated/restored show houses of the past. To start your tour you’ll be whisked by elevator to the master suite which occupies the entire 4th floor. This amazing space features beautiful views of the harbor and wetlands near the Cape May bridge. The bedroom is immense and decorated beautifully throughout. Though the incredibly large closets were not decorated, they probably could have been. If you want to have bathroom envy, just stroll down the hall in the master bath suite with its custom shower, 2 person whirlpool tub and magnificent decor. Stroll down the stairs to the 3rd floor and you’ll find yourself in the beautifully decorated living space than includes the living room, kitchen and dining room. All three of these spaces are wonderful and have to be seen to be appreciated. The 2nd floor contains creative and wonderful guest rooms & baths, featuring some very impressive mural art and special touches. The first floor has an incredible mural in the entry way (you’ll see it when you first walk in), a garage filled with really cool old vehicles that rotate (a cherry ’67 Corvette was there when we went through) and other interesting items. Even the back yard ground floor porch is a delight. I definitely suggest you make your way to the show house this year. Personally, I recommend the luncheon package at the Carriage House Tearoom & Cafe package. It is a great afternoon! 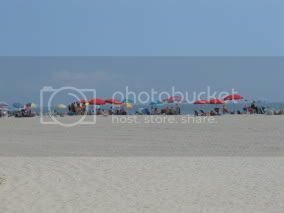 I know that for many of you the beach is your primary interest every day you are in Cape May. 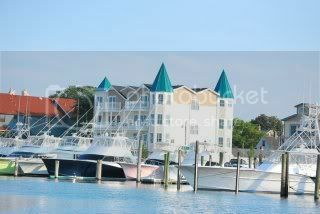 That would be Anna Marie’s and my own approach to a summer stay in Cape May (if we didn’t already live here, of course). BUT, there are lots of you who really don’t do the beach and there is always the outside chance of a rainy day for you beach goers, so having other fun things to do is great. Our favorite non-beach activity is definitely a trip to one of our local wineries. Anna Marie and I love to spend an afternoon at either Cape May winery or Hawk Haven winery. Both wineries open daily at 12:00 noon and are open throughout the afternoon. Picking a favorite would be tough for me, as they are both wonderful in their own way. Cape May winery is a bigger winery with two or three different tasting rooms and lots of patios, decks and comfortable rooms to sit, relax and enjoy a glass of wine. Hawk Haven is a more intimate setting with a single tasting room, a lovely barrel room and patio area to relax and enjoy the winery. The wine is truly great at both. Don’t make me choose! Anna Marie and I like to grab a take-out lunch, head to either one, do a tasting and buy a glass (or maybe a bottle) of our favorite wine and enjoy it with our lunch. Can you think of a more relaxing way to spend an afternoon? The other day we did this at Cape May winery on their newly expanded back patio and had a delightful time. I think you will too. So, you’re planning on visiting us in early August and you want to do something really special and interesting. OR, you don’t yet have reservations for early August, but a trip to Cape May sounds fun and you need that extra little incentive to make the commitment. Either way, I’ve got just the thing for you. 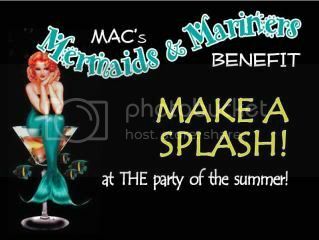 On August 6th the Mid Atlantic Center for the Arts (MAC) is sponsoring a very special fund raising benefit called “Mermaids & Mariners” at Osprey Landing, which is the site of the 2011 Designer Show House. You don’t have to be either a mermaid or a mariner to attend, but if you are either you’ll be a big hit at the party (especially a mermaid, I imagine). This is most assuredly going to be the event of the season! Dress is casual, but if you come in a nautical themed outfit you’ll get a free raffle ticket at the door. The event runs from 7-10pm with lots of seafood and some good land-lubber fare as well, served all night long. An open (top shelf) bar will be serving you what ever you want to drink throughout the evening. That’s a good thing too, because you’ll be dancing all night to a live band called “Hennessy & Jack”, who are famous for the seafarer music they play at the Lobster House each weekend. This really will be the party of the season in Cape May and a good time is sure to be had by all. It’s also for a good cause: supporting MAC’s educational outreach program. I hope you’ll be able to join Anna Marie and me for this fun event. Look for us on the dance floor! Everyone loves a package. In years past, however, we never had any great packages to offer during the summer. I’m pleased to say those days are gone. This year Anna Marie and I have partnered with the Merion Inn to offer the “Taste of Cape May” package. This is a great dining package for two people that features a 3-course meal at the wonderful Merion Inn restaurant, just steps from The Queen Victoria. You’ll be greeted at the door with a special smile by the host or hostess and escorted to the best available table. Anna Marie and I worked with Vicki, the owner of the Merion Inn, to create an incredible 3 course menu that has something for everyone. Beyond all the wonderful appetizers, salads, entrees, and desserts on the menu, you’ll also find real VALUE. This package includes tax and gratuity, so all you have to do is sit down and enjoy one of the best meals in town. Long ago I thought that the best way to keep Anna Marie from shopping all the time was to give her a gift shop to operate. I discovered it didn’t really work, but now a fair amount of her shopping is for items to feature in her gift shop. Even though this type of shopping isn’t as much fun for her as the kind she used to do, it makes shopping in our gift shop more fun for you. Here is my lovely bride modeling our newest gift shop item … our new Queen Victoria beach bag. Just think how great you would look strolling down to the beach and setting up your chairs with this stylish (one might say chic) bag on your shoulder. There is plenty of room for towels, sun screen and your favorite book. Anna Marie wanted me to point out that this also makes a wonderful shopping bag in this era of environmental consciousness. I can’t imagine why I didn’t think of that myself. These really are great looking bags. You’ll feel like real royalty walking around with this on your shoulder. Best of all, it is cheap! Are you a member of The Queen Victoria “Saturday Night Club”? Are you one of those folks who would come to Cape May a lot more if you could just get in for a 1 night stay on Saturday Night, then you should join this club. Every once in a while when I notice a few of these special (and rare) 1 night Saturday openings I send out an email telling the club members about them. It works great. They get a quick visit to Cape May and we rent our empty room to some of our favorite guests. Everybody wins. I thought I’d give you all a taste of the club in this newsletter, since the timing was right. These are great opportunities to get a break on our normal minimums thanks to the folks that booked around them. We love to share these openings with our loyal and favorite guests first, so give us a call and make plans to sneak to Cape May for a quick trip. Don’t wait too long, these will go fast! · Halloween in Cape May Oct 14-31 LOTS of events! Summer is definitely here. In Cape May that means early morning strolls along the beach, eating breakfast on the porch of Prince Albert Hall, days filled with sand, surf & sun, and of course a return to Prince Albert Hall for afternoon tea on the porch. There is obviously more, of course, including lunch at Hot Dog Tommy’s, and the daily struggle to choose which restaurant to dine in each night. It really doesn’t get much better than summer in Cape May. While summer is now well under way here, I’m guessing that a few of you haven’t yet made your summer plans. The good news is that you still have time to do so. Sure July is pretty booked up, but we still have several open rooms, even on weekends, that are available and waiting for you to book. August has even more openings for you to contemplate. So, don’t let summer slip by without a visit to Cape May and The Queen Victoria. Give us a call and we’ll find the perfect room for you. I thought I had featured all our rooms, but I just realized that I forgot one of our newest and prettiest rooms … Brighton. Brighton is one of our two new rooms in the Queen’s Cottage. It is special in the sense that it’s private bathroom, a beautiful large room featuring a wonderful walk-in shower, is located just outside the room, across the hall. It is the only room in the inn that is configured this way. At first I was nervous about creating a room whose bathroom is not “in the room”, but feedback from our guests has confirmed my own feelings that it is a wonderful set up. Let’s face it, you get a lot more privacy when your bathroom is down the hall than you do if it is in the room. As you can see from the photo, the room is beautifully decorated with rich colors and stylish accents. What your eyes can’t tell you, though, is just how comfortable and quiet the room is. Anna Marie and I had occasion to live in this room for a couple of months as we were renovating the rest of the space and we really loved it. I think you will too. I’m happy to inform you that construction of the new Convention Center is well under way. Each morning as I walk past the construction site I observe a crew of men working hard (kind of) to build forms and tie re-bar for the concrete foundations that are being built onto the concrete pilings that I reported to you last time. 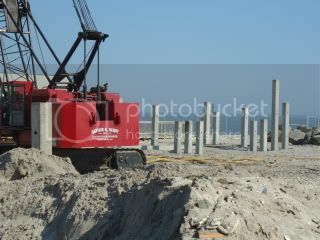 It is pretty interesting to watch the progress as they make their way across the beach. It is hard to say if construction is on schedule at this point, especially since I don’t know anything about construction or the schedule. If I had to guess, I’d say we’re a little behind schedule for an April 2012 opening, but that is based on the long delay between the installation of the pilings and the start of the next phase of the project. Besides, aren’t construction projects always late? If you ever want to get one of your photos published in our newsletter, it is actually pretty easy. All you have to do is take a great picture of our sign. It is almost impossible for me to resist posting a great photo of our sign. In fact, I’ve posted several of them over the years. This picture by Susan Carlowicz happens to be exceptional, however. I didn’t realize what a talented artist Susan was until I saw this photo. 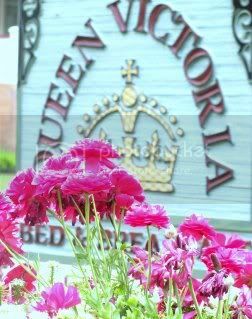 This was taken from the front porch of the Queen Victoria building, towards our sign (and the beach). Somehow Susan managed to focus on both the beautiful and very close peony blooms and also on the much more distant sign. How she was able to make the sign look so large and maintain the focus on our Peonies is beyond me. I guess that is why I am not an artist/photographer. Anyway, thank you Susan for such a wonderful photo. I really love it. Once again this season Cape May Stage has put together a wonderful season of entertainment for our visitors. The Understudy, which is the second show of the season, opened up last week to rave reviews. Anna Marie and I haven’t had a chance to see this show yet, but we’re looking forward to it. Many of our guests have seen it and they have all raved about it. It really does sound good. The Understudy is a smash off-Broadway hit about a big time Hollywood action hero actor starring in a new Broadway hit (are you with me so far?). All is well until said star meets his understudy. The stage manager, apparently smitten with one (or perhaps both … I’m not sure) of the actors, attempts to prevent a battle erupting between the two. Sounds like lots of high-spirited and funny dialogue (which apparently includes some explicit language and adult themes). If you’re looking for a fun way to spend an evening during your upcoming visit, make plans to attend this show at Cape May Stage. The Washington Inn is most assuredly one of Cape May’s finest restaurants. If you’ve been coming to Cape May for a while, then you probably already know this. I guess that means that this feature is for our newer guests that are just learning about Cape May. If you are a Cape May veteran, stay tuned though. I’m going to throw some great information for you out there too. First of all, I need to tell you that we’re talking about “Fine Dining” at the Washington Inn. While in years past this meant a jacket & tie were required for the men, things have lightened up a bit in recent years. These days, “resort casual” is the theme, though you’ll still see lots of folks dressing for dinner here. Personally, I like to dress up a little bit and make the experience seem that much more special. OK, lets talk food. It is consistently EXCELLENT at the Washington Inn. The menu varies quite a bit from week to week, but no matter what you order, it will be wonderful. In recent weeks Anna Marie and I have enjoyed their salmon, prime pork chop, chicken saltimbocca, and local swordfish. The sides are always creative, and the desserts are delicious. OK, so here is my tip that all of you, newbies and veterans alike, should love. Every Sunday is “Wine Appreciation” night at the Washington Inn. I appreciate wine every night, but I really appreciate Sundays now because I can bring my own wine to the Washington Inn. Yep, it is true. No corkage fee or anything! This really is a great opportunity to have a BYOB experience at a great restaurant with a fairly pricey wine list. I’ll leave you with two final thoughts … 1) Arrive before 6:00 and take advantage of the phenomenal $24 3-course early dinner. 2) Bring a bottle of Cape May Winery wine on Sundays. The Craig family owns both the Washington Inn and the Cape May Winery, so you can show your appreciation for their “Wine Appreciation” night by stopping by the Cape May winery to pick up your wine for the evening. 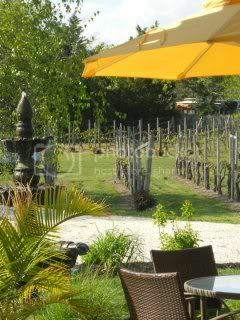 It will be a great excuse for you to experience the Cape May Winery, which is a wonderful experience, indeed.